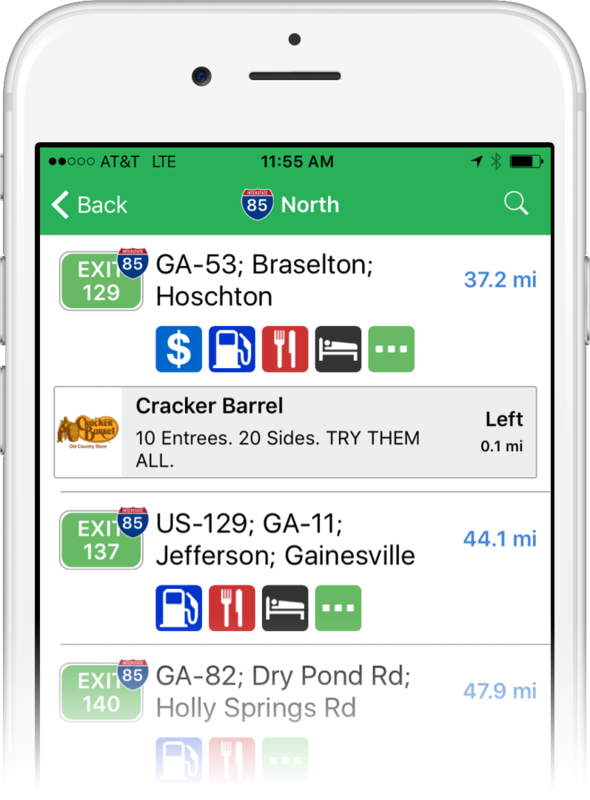 Atlanta, Georgia - May 22, 2018: iExit, the smartphone app that knows what’s at every Interstate exit, is partnering again with Cracker Barrel Old Country Store® to promote all of its restaurants along US Interstates for the Summer of 2018.
iExit uses a smartphone’s GPS location to automatically detect when a user is on a US interstate and then displays upcoming exits and businesses without the press of a button. It also provides a powerful and intuitive search engine that allows users to see only the upcoming exits that have what they need, whether that’s diesel fuel, coffee, free Wifi, or even a specific business like Cracker Barrel. iExit has partnered with OPIS to display real-time gas prices by exit, as well as with Yelp to display its ratings and reviews by exit. Cracker Barrel Old Country Store® serves authentic, high-quality, homestyle meals prepared from scratch. Cracker Barrel is known for providing a friendly, home-away-from-home atmosphere in its 648 restaurants and old country stores located in 43 states. Of its 648 restaurants, 565 of them are located near an Interstate exit. Starting today through the end of July, Cracker Barrel’s brand will be promoted throughout iExit. Each of its 648 locations will be promoted, and each of its 565 exit-based locations will become the Sponsored Business at their respective exits. For more information, please contact sponsorship@iexitapp.com. iExit Interstate Exit Guide is a smartphone app for iOS and Android that helps Interstate travelers nationwide decide where the best place is to stop for a break. It was first released in January 2010 and has over 2 million downloads to date. It has been covered by over fifty media outlets, including USA Today, The Today Show, Consumer Reports, and The New York Times. iExit is available for free in the iOS App Store and Google Play Store. For more information about iExit, visit iexitapp.com.